What are clergy for? In this lively and provocative book, Alan Billings argues that they serve the mission and ministry of the Church, which is to make God possible (or findable). Making God Possible by Alan Billings was published by SPCK in April 2010 and is our 10192nd best seller. The ISBN for Making God Possible is 9780281062287. Rev’d Canon Dr Alan Billings is a highly informed and experienced writer, one of the doyennes of Radio 4’s ‘Thought for the Day’. 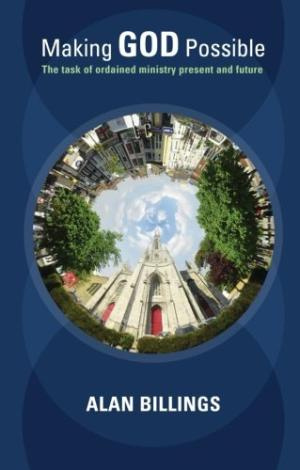 Subtitled The task of ordained ministry present and future, this book sets out a clear, concise yet comprehensive account of how the Church in Britain and its ordained ministry come to be where they are in 2010. It describes cogently the styles of ministry characteristic of Evangelical and Catholic wings, showing how each positions itself in the current religious and secular climate. It summarises current social themes that have encroached on former clergy roles, and the challenge of the rise of secular humanism. Billings’ stance throughout is predominantly Anglican; it would for instance have been good to have had a mention of the Anglican Methodist Covenant and its working towards a common ministry. Looking to the future, He rightly pinpoints the need for what he calls a ‘teaching ministry: the intellectual contribution of the clergy’. He sees an important role for pastoral ministry as providing a haven in times of national distress. This is a book that may be read to advantage by both ordained and lay at a time when the growth of their shared ministry is seen as the only way forward for the Church, as it attempts to retain the possibility of God. Got a question? No problem! Just click here to ask us about Making God Possible.